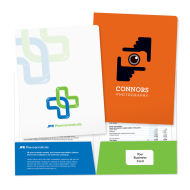 Our two pocket folders will dress your presentation for success! Our custom 2-pocket presentation folders are printed in 1-color, 2-color or full-color, and made from our collection of high-quality paper stocks. 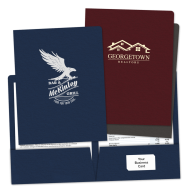 Also, check out our imprinted business folders elegantly embossed or foil-stamped in a variety of colors. 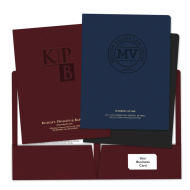 All our business presentation folders feature right pocket business card slots and two 4” pockets to hold letter-size documents, brochures and more. G7 Master Qualification – The Mines Press conforms to the strictest global standards for both proof and print. Our skilled staff are proven leaders in print production and our equipment is maintained to the industry's highest standards. The Mines Press' folders will help you create an impressive-looking presentation that will give your brand the image it deserves. Pocket folders are great for presentations, reports, leave-behinds or to keep your clients organized after meeting with you. 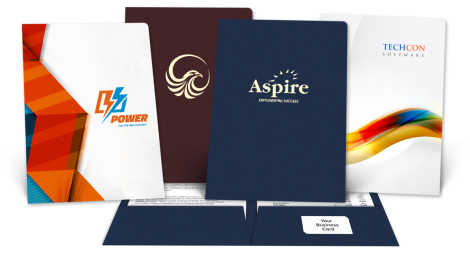 Our folders are custom printed, foil-stamped or embossed, and constructed with the finest, premium paper stocks. All our two-pocket folders have 4" deep pockets with die-cuts for your business card. 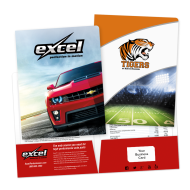 When you buy our custom presentation pocket folders, you can be sure that your company is getting the best quality at the best price!